Mission Viejo, California The gourmet jerky market share is an explosive artisanal new niche in the snack industry, recently predicted by Forbes Magazine to be the next big food trend. Jeff’s Famous Jerky announced the release of their latest gourmet product today …Real Bacon Jerky, gourmet strips of crisp real bacon in three flavors …Maple Brown Sugar, Sweet Lemon Pepper and Honey Jalapeno. Their Real Bacon Jerky, sold in 2 oz. re-sealable bags is totally shelf stable, without any refrigeration required and it stays crisp with a shelf life of up to a year. Beef jerky expert, Steve Johnson of BestBeefJerky.org says, “Jeff’s Famous Real Bacon Jerky offers a better overall bacon flavor and seasonings than other gourmet brands of bacon jerky,” and he gave the product his highest Five Star Best Rating. 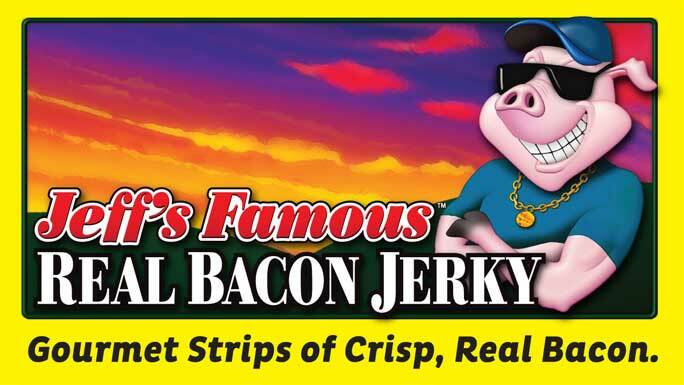 Purchase Jeff’s Famous Real Bacon Jerky or their full line of beef jerky on their company website; JeffsFamousJerky.com and at a growing number of retailers across America including some branches of 7-11, AM/PM, CVS, Walgreen’s and many more.